Another terrific photo. I smiled. That is GORGEOUS! I love the detailing around the eye. Thank you. This crop was somewhat inspired by your spiny lizard photos. There seem to be lots of baby lizards out this week. They aren't very good at hiding so they are easier to photograph. This poor little guy didn't know what to do. He kept running up and down his little section of vine trying to hide in plain sight, so I got a bunch of pictures of him. 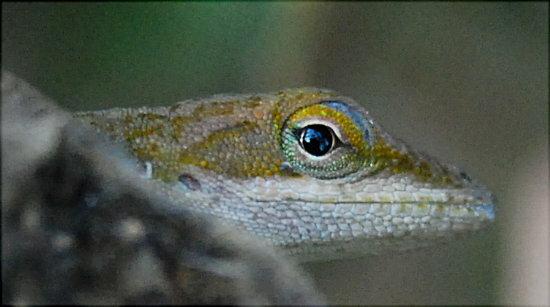 And earlier in the week I ran across a baby spiny lizard hiding in the grass on the land. Even though it kept running and stopping just a little ways in front of me, I only got a couple of blurry shots of it because the scrub was in the way.